In late autumn the Tea Guild of Australia at its property in Crookwell NSW, Australia, planted fifty Camellia Sinensis plants. This experimental garden was to examine how Biodynamics may affect the tea plant itself when growing and also production and finally drinking. As a former director of the Biodynamic Farmers & Gardeners Association and now a member of Biodynamic Agriculture Australia I was intrigued by a question on the influence of Biodynamic concepts on the tea plant that was put to me in a tea school in Singapore. I had led a group of tea enthusiasts to Sri Lanka on the 150th anniversary of tea being planted on the island. During our return to home, we took advantage of a few days layover in Singapore. On a particularly rainy afternoon whilst we were walking down Mosque Street I heard my name being called. When I looked at this tall, imposing and smiling man who had called me he said “My name is Kenny Leong, we are Facebook friends!”. Kenny graciously invited us to his tea school just a few doors away. It was at this chance encounter as we drank tea, that Kenny asked if I thought Biodynamic methods would have an influence on tea production and drinking. It was at that time I determined to experiment and find out. For those people with no knowledge of Biodynamics let me give a short introduction. “Biodynamic gardeners and farmers strive to create a diversified, balanced…ecosystem that generates health and fertility as much as possible from within (the garden, property or) farm itself. 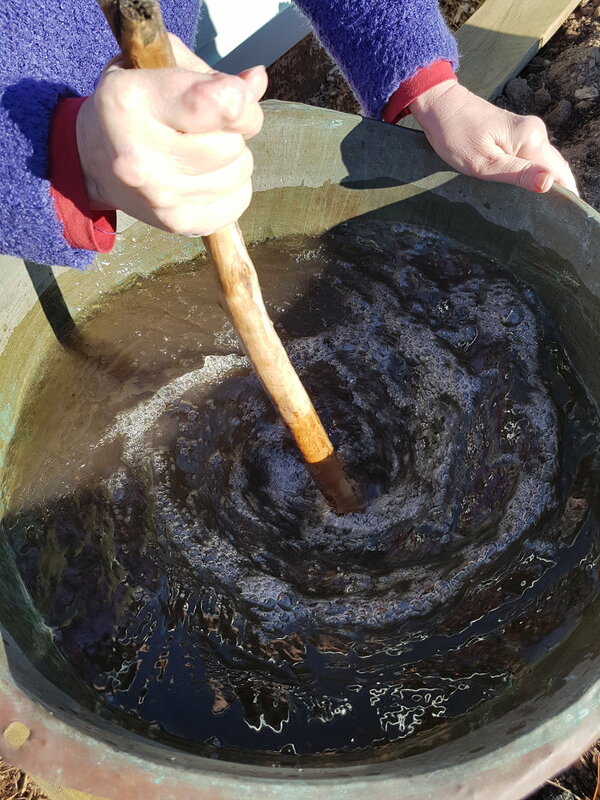 Preparations made from fermented manure, minerals and herbs are used to help restore and harmonize the vital life forces of the (area or) farm and to enhance the nutrition, quality and flavour of the food and produce being raised. Biodynamic practitioners also recognize and strive to work in cooperation with the subtle influences of the wider cosmos on soil, plant and animal health.” From the Biodynamic Association of the USA. It is essentially also a totally organic process. These principles then influence when to work with the plants, fertilizer, prune, harvest etc. And this is what we shall apply to the Tea Guild of Australia Experimental Biodynamic Tea Garden. The tea bushes have been in the garden for nearly two months now and we are still in the middle of winter but today it is indicated that it is a good time to begin the use of Biodynamic preparations for this country. The 21st July and after 3:00pm in the Southern Hemisphere is the time to apply preparations. 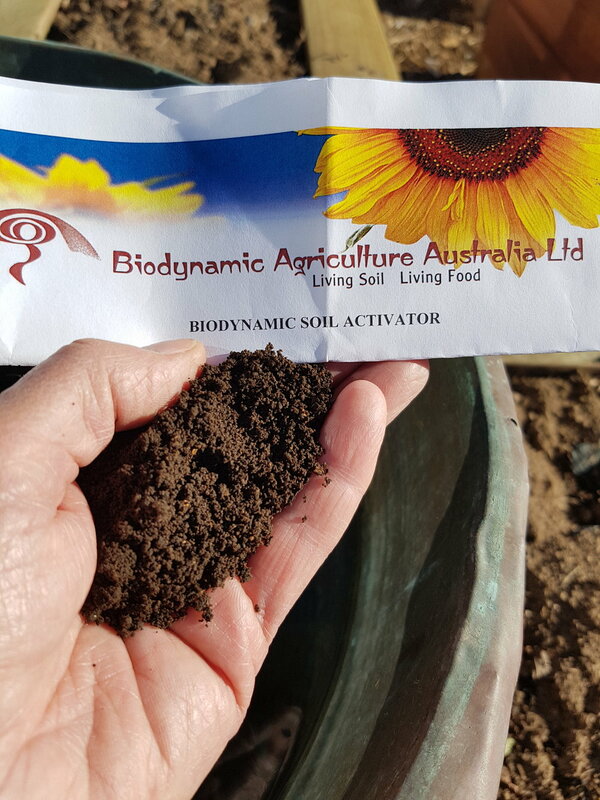 Today I used “Biodynamic Soil Activator” which was developed by Gregg Willis of the USA. This preparation contains cow horn manure (500), cow horn silica (501) Biodynamic compost preparations (502 to 507), Equisetum (508), all year cow horn clay, cow horn basalt and egg shells. The numbers in brackets refers to the code numbers that were originally used for these products. I have chosen to use this preparation as this is our first Biodynamic application and this is a good broad preparation containing the building blocks of soil health. When put into water and stirred for 20 minutes in a particular way as to form a vortex, alternating directions of clockwise and anticlockwise, the active preparation is then sprayed over the garden to stimulate what is known as the “food web” This enhances the breakdown of organic matter, boosts beneficial fungi and bacteria, increases the earthworm population and increases water retention in the soil. This all leading to a healthier garden and its plants. The area is then tended with Biodynamic considerations as to pruning and other cultivation methods. This is an interesting experiment in regards to how this may affect tea production. Although this is a very small area as far as tea production is concerned we are keeping records of our experimental garden and we shall keep you up to date on all of its activities.